It’s late on a Saturday night here in Indiana, but that just means I actually have a minute to myself. And so I’m sharing that minute with you all. I decided this week to try to do a few things that were just for fun craft/sewing wise. Sometimes with all of the deadlines and crazy fabric swaps I sign up for, I get a little caught up in the details of maintaining my sewing existence. Don’t get me wrong. I love it. But sometimes a girl just needs to break out the felt and a glue gun and go to town. I meant to make a fall decoration for the house. It is after all, fall. 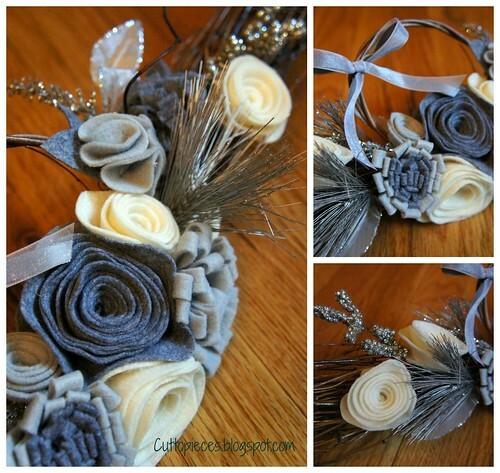 But the grey, silver and cream colors were what I continued to reach for while I made this. I had other colors around me, I promise. But this is what I wanted. Something a little more subtle and perhaps slightly chick. It has found a temporary and perhaps permanent home atop the china cabinet…though I really would like to hang it on the wall. 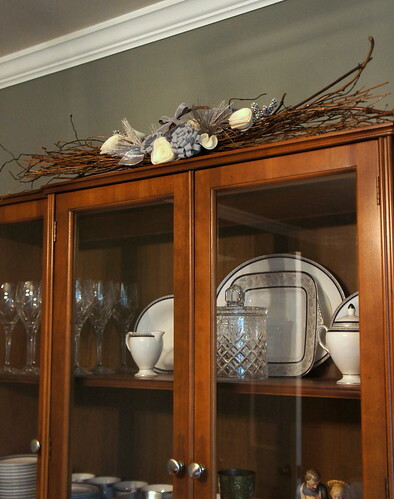 You kind of lose it up there on the china cabinet. But for now it is safely away from my two year old’s hands…hands that LOVE sparkles and flowers. A girl after my own heart quite obviously. You are a glue gun goddess!!!! That's a lovely piece you created! It looks very elegant. Beautiful! At first I thought you had used denim – great colors! So pretty Angela!!! Love it!!! It's lovely! I adore your felt flowers. Glue gun magic at it's finest :). Holy geez! 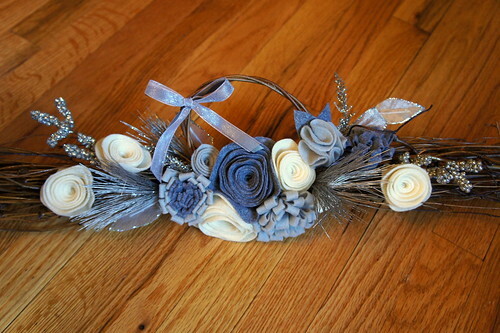 I don't think I could ever make something so lovely with a glue gun. Pretty, pretty!